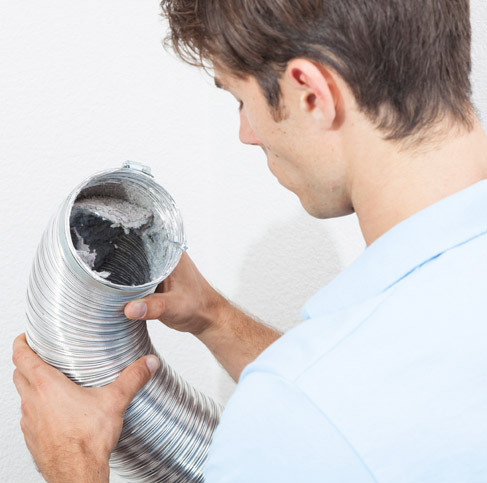 Duct cleaning experts recommend that you have your dryer vent professionally inspected and cleaned every 2-3 years. Dryer vents full of lint are a common cause of residential fires and mechanical failure of your dryer. A quicker drying time may also help to reduce your utility bill. With every laundry session, you’re adding more particles to the vent. They might exit it, but much of this lint remains stuck to the vent’s walls. The lint accumulates and blocks the conduit. The air from the dryer cannot exit the area very swiftly now. Heat builds up and can potentially start a fire. Hundreds of dryer fires happen every year. You want to avoid this scenario. A professional HVAC technician usually performs the duct-cleaning service. He or she places tools into both ends of the venting conduit. The dryer itself receives a thorough cleaning along with the vented area where lint accumulates. The professional takes a brush and vacuum to the dryer’s exhaust exit area. This opening is much wider than the opposite side. He or she should be able to remove as much lint as possible from the venting walls. In some cases, the conduit may be removed in order to reach every curve in the line. Ideally, hire a professional once a year for a dryer-vent cleaning. The experts are able to reach areas that are difficult for everyday people. They also have the required tools for the job. Every system has a slightly different arrangement too. The experts take this fact into consideration so that they can cover every inch of the conduit. If you notice any unusual issues, however, you should considering hiring the professionals more often. The dryer might be working too hard, which will shorten the life of your appliance. There might be a clog in the vent that requires immediate attention. Don’t put off these observations. A change in operation does mean something in the scheme of things. There are a few tasks that residents can complete in order to maintain the dryer vent. Keep a cap on the system where the exhaust exits the home. Try a mesh cover on the exhaust end within the dryer. Clean off the lint that’s trapped in the mesh with every cycle. Pull out the vacuum every month, and remove any lint that’s moved past the mesh. These tasks will keep the home safer than ever before. Don’t wait until there’s a real emergency. Set up a service schedule with a qualified professional. These visits will take any stress off your mind. Safety will remain constant at your home with these routines in place.